Hello fellow Losties! Well, I can't lie. That was one crazy episode. But even in the crazy time travel world of LOST, it all seemed to be making sense by the end. And you gotta love an episode of Season 5 LOST when we get to see a QUANTUM LEAP! (I know I know, me calling it that is getting old! I know we are supposed to call them "Flashes"). Lots of juicy tidbits dropped in this one and some nice plot movement. Plus, it was a Desmond-centric story. What's not to like?! Well, for one thing, it's hard to watch the Island story progress with only Sawyer and Locke on the Island from the original cast, unless you count Rose too. (come to think of it, they're the only 2 characters from the original cast featured in this episode). But, it's a necessity to tell the overall story. And we're told, the story does move quickly this season. So we'll just have to see when they are all reunited! Let's dive into the story. So the episode is called Jughead, and while he's the main sidekick in the Archie comics, and it's the name of an awful Gulf War movie where the only memorable thing is Jamie Fox saying "Hoo Rah!," we don't find out why the episode is called that until closer to the end of the episode. And it has nothing to do with a person! We continue Desmond's story in this episode after he received the memory and gets his mission to find Daniel Faraday's mother at Oxford (although we already have suspicions on who this might be! Even further confirmed tonight.) And I guess after 2 episodes now, we see how they're going to incorporate Flashbacks this season. Hurley got one flashback to the Oceanic 6's initial moments off the island. Now Desmond got one flashback to what he's been up to since he has left the island. I like this idea. And since they opened with the flashback, it doesn't get confusing with jumping from Present Day to Island Time the entire episode. Speaking of the Island Story, we pick up right where we left off after the flaming arrow attack at some point in the distant past. Here we go! We start off with a Desmond flashback from some point after he got off the Island and was with Penny. Still living on Jack's mantra "Don't let him find you Desmond." We learn that Penny gave birth to a child, and the name is withheld from us until closer to the end of the episode. In the present day, Desmond, Penny and Son are approaching the U.K. in search of Faraday's "Mum." (I had to throw in a little English twang for you!) Penny is worried about her father finding them. Desmond is determined to help his Island friends. He returns to Oxford and there is no record of Daniel Faraday ever working there. He breaks into Daniel's secret Physics lab (ahhh memories from "The Constant") and we get to reminisce on the big scene with Eloise the rat, Daniel with the mullett, and Desmond with the consciousness time travel disease! Some mysterious janitor dude came and basically knew what experimentations were going on in the room (even though he didn't believe Faraday could actually send "brains through time") and tipped off Dez on a human guinnea pig of Daniel's that he put in a vegetative state (Theresa). He follows the lead to Theresa's residence and finds out some interesting developments with Charles Widmore. The rest we'll save for the bullets! 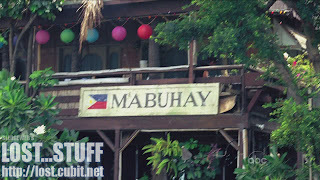 Not much to dwell on here, except we know that Dez and Penny were hiding out in the Phillipines because we had a flash of the flag and the word Mabuhay which Wikipedia tells me is a common greeting in the Phillipines. As for the time of this event, it must've been soon after they left the Island (like 9 months) because that boy is getting big in the present day! Dez and Penny didn't waste any time! As they were approaching the "Island" of the Great Britain. Desmond was telling his boy stories of a Special Island that he never thought he'd see again that had Mountains and Monsters, etc... I'm sure it was just meant to draw mini-comparisons. But you have to wonder if Dez is starting to get a little "homesick" about the Island too. He still seems pretty determined to never return to the Island though as he tells Penny. Penny doesn't seem to be on board with Desmond's desire to return to the area where Charles Widmore resides, but she loves that crazzy Scot too much to not let him follow his time traveling memories. The question was asked, that I wanted to know the answer to, of why Desmond suddenly got the memory 2 days ago. Naturally, Desmond said that he didn't know how it worked. But at least they addressed it, and maybe there will be more on this. After the wild goose chase at Oxford and Dez got the tip that Faraday did "bad stuff" to this Theresa, Desmond visited their house and met Abigail and Theresa Spencer. Abigail (the sister) is not a big fan of Daniel Faraday's who skipped town right after he put Theresa in this vegetative state. Abigail made some interesting comments like Theresa is "away right now." And that Theresa was talking to their father who had died 5 years before. Okay, so I'm guessing Daniel zapped Theresa with his violet time-travel taser (the one he zapped Eloise the rat with). So perhaps Theresa is consciousness time traveling as well (and everyone else thinks she's nuts). Here's the thing. Desmond was barely going to last a day when he started going back and forth through time. For Theresa it's been "AT LEAST" 3 years, but when did Daniel flee to the United States before he was recruited for the Freighter? Crazy. I guess this could also be attributed to the effects being different for each individual. The other thing is, now Theresa is talking to dead people and she's never even been to the Island. Hmmm Do we think the Ghosts on and off the Island are related to all of this Time nonsense? It's a stretch, but why would they have thrown that line in there? Oh yes, and we also learn that Charles Widmore has been funding Daniel's experiments and has been keeping Theresa alive. Does Widmore know how to sustain a person in this condition? Perhaps! But the main thing is, Desmond knows who he needs to confront next. Desmond wants the location of Faraday's mother. Eventually Widmore gives it to him (Los Angeles). Widmore warns Dez that this war over the Island has been going on for a long time and doesn't concern Dez and especially Penny. "Deliver your message and go!" Widmore also mentions that Faraday's mother will not be happy to see Desmond as she is a private person. Hmmm, well we speculated that Ms. Hawking could be Daniel's mother. And now that we know Widmore knows her and the fact that she is in Los Angeles, it sure is looking like it's going to be Ms. Hawking. Another thing that ties it together is that apparently in the re-airing of last week's 2nd episode "The Lie" with the clues coming up in pop up text, they provided Ms. Hawking's first name --> Yup, it's Eloise!!! (the same as the time traveling rat!) We will get to more on this in a bit. But, even though Desmond tried to forget about his quest, Penny saw right through it and told him that the 3 of them are headed to Los Angeles. The other big reveal? A touching moment when Desmond calls his child Charlie for the first time. awwwwwww That's right, the same Charlie who sacrificed his life to bring Desmond and Penny back together. That was nice. And I'm only going to write this theory here because I want it noted that I thought about it if the producers ever decide to do something this crazy and wacky (although I don't think they will!). What if this child holds more significance in the scheme of things. And since Desmond is all about the time travel. What if baby CHARLIE is none other than Charles Widmore, who ends up on the Island and grows up to be the so-called evil person that he is today? That is kind of sick and diluted. I would've said what if he is actually Charlie Pace, but we met Charlie's parents! I don't think they'd mess with the storyline that much, but there are lots of Charlie's to go around, so I thought I'd go all crazy theory on you for a second! Here's the other thing, IF Faraday's mother does indeed turn out to be Ms. Hawking, what is her relationship to Charles Widmore? If he is still in touch with her, does he know that Ben Linus is also in cahoots with her? Also, who would be Faraday's father? And was he raised in the U.S.? Because he doesn't have a British accent! More on Ms. Hawking when we get to the next topic. Update: Forgot to mention that Desmond FORGOT what year he had originally met Dan. Even though he knew before that it was an 8 year difference between 2004 and his current self at the time which was 1996. Is this similar to Charlotte forgetting her mother's maiden name? Before their capture, Charlotte's sickness symptoms seem to be getting worse. She tells Dan that she has double vision and is constantly dizzy. Dan is determined not to let anything happen to her. Hmmm does he know something we don't? After "The Others" capture Dan and crew we get some revealing information. Crazy Miles has some run-ins with "Fresh Graves" of 4 U.S. Soldiers, one of which died of Radiation poisoning. The interesting thing is Dan asks if any of them TOLD Miles what year it was. Hmmm, okay, time travel expert asking about Ghosts "talking" to Miles. Anyone else thinking of our new friend Theresa in England? And I guess we have to keep wondering why Miles can sense the dead everywhere. Was he indeed baby Chang that we saw in the season premiere? Time will tell. We get to the Other's Camp which is comprised of lots of Tents. I guess this is how they lived before they ransacked the DHARMA barracks. Of course, we've seen them living in tents before when they left the barracks upon John Locke's advice to get more in touch with the Island. Apparently, "The Others" think that Dan, Charlotte and Miles were with these U.S. Soldiers that were doing experimentation on the Island. That's right the U.S. was doing Hydrogen Bomb testing in the South-Pacific in the 50's. We find out that the soldiers left behind an unstable device capable of destroying the whole Island. Dan somehow earns the "OTHERS" trust by saying they were scientists with the U.S. Military and because he is in love with Charlotte and that he'd never hurt her. Yeah, because that would convince me to trust someone with dismantling an H-Bomb! I guess it's no matter because Charlotte at the line right up! So, I guess the Island is back in the South Pacific? We know that the Island has moved to at least 2 other locations at some point....off the coast of Nigeria, and somewhere in the Indian Ocean when the Black Rock suddenly was shipwrecked in the middle of the Island. How long they stayed in those locations? We're not quite sure. Oh well, I'm sure they'll touch on this eventually! Richard (have I mentioned him yet in this blog?) informs Dan that there was a battalion of 18 U.S. Soldiers. They tried to assimilate them into "The Others" but when they refused they were forced to kill them. Richard mentions he follows a chain of command. Hmmmm Jacob? Or their current leader at the time? Update: I totally messed this one up. The Battalion was setting up camp around them and THE OTHERS asked them to leave the Island. When they refused, THAT is when they were "forced to kill the US Soldiers"
A little bit of discussion happens with Locke/Sawyer/Juliet about "WHEN" they are and have been and Locke almost telling them he got shot by Ethan. But in the good ol' tradition of LOST, Juliet cuts off the conversation to avoid showing all of the characters catch up"ON-SCREEN"
We find out from Juliet that "The Others" speak Latin. Why? Well, it's "Others 101" of course! Juliet tries to reason with "Jones" and "Cunningham" (the name tags on their stolen U.S. Uniforms) in Latin. Even drops Richard's name to try and have a peaceful resolution. Cunningham agrees, and Jones snaps Cunningham's neck and runs off. Sawyer tells Locke to shoot, and Locke doesn't. Why? "He's one of my people." That crazy John Locke! Locke asks Juliet how old Richard is. The response - "OLD" Well, that didn't give us many answers. Buuuut, how old is "ooooold?" Could Richard have been with the Black Rock crew? Or even have been there longer? 4-toed statue longer? And why on earth doesn't he age? I want answers!!!! Update: After 2nd watch, Juliet said that Richard has "always been here" Always is a lengthy period of time! Anyway, Sawyer puts a little bit of humor into the situation dismissing Locke's idea to go walking into the camp and decides to put his faith with "the real person that is going to save us" That's right, Daniel "The Geek" Faraday! He sees him being led away by gunpoint by the british woman. Sawyer and Juliet decide to follow them. Locke continues into the Camp. Eventually Dan and Ellie get to to the H-Bomb. And yes, it's called "JUGHEAD!" Apparently, there was a real "Jughead" experiment with Hydrogen Bomb testing. You can read all about it here. After inspection, Dan informs Ellie what "The Others" need to do with the bomb. Bury it and fill it with Concrete. Hmmmmm sound familiar? Yep, remember the Swan Hatch? (you know the one where Desmond pushed the button). Sayid inspected the hatch and noticed that there was an entire area surrounded by concrete. Perhaps, DHARMA built the station close by to the bomb? They mentioned an "incident" on the orientation video, could it have been tied to this? I figured that DHARMA would've surrounded the bomb with concrete after the Incident. But maybe it went down a little differently. And where does Electro-magnetism come into play? Ohhh...aaaandddd maybe this means that Desmond WAS exposed to Radiation AND Electro-magnetism when the hatch blew (sending him off on his time-travel adventures). I mean, it's way too coincidental not to be hatch related! I mean, think of the sign that said QUARANTINE on the hatch door too. Crazy!! Sawyer and Juliet show up to rescue Dan from Ellie who isn't buying into this whole time travel thing. Best line of the night: Ellie - "Are they from the future too?" Sawyer (to Dan) - "You told her????" Ahhh good stuff! So Locke enters the Others' Camp and tells Richard the magic words "Jacob sent me" Jones still wants to shoot. Richard then calls Jones by his real name......"WIDMORE!!!" Okay, I know it was pretty obvious, but you guys gotta hand it to me on that one. Once I heard the British accent last episode, I knew we were witnessing a young Charles Widmore! Now we know Charles was with "THE OTHERS!" He also has informed Ben that the Island was once HIS and it will be again. So this goes with my older theory that maybe Charles was the leader of the Others PRIOR to Ben. Although, it does not look like he's the leader just yet. Also, this helps with the Ms. Hawking theory as well. Ellie and Charles were on the Island at the same time and appeared to be the same age. That would mean they'd probably be about the same age in 2007 (yep 3 years after 2004). And that fits the bill for Charles and "Eloise Hawking" Ahhh good stuff! Anyway, it was great to see Locke's reaction to meeting Charles Widmore. Because it indeed is the first time they have met. Who knew it would be in 1954? Okay, so the big discussion between Locke and Richard occurs. The one that future Richard (how far in the future? we don't know) knew was going to happen. Locke gives Richard the Compass, tells Richard that Locke was appointed their leader. Richard explains that recruiting a leader is an extensive process that starts at childhood. Locke tells Richard the date he was born. May 30, 1956. NIIIIIICE! We saw Richard in John Locke's birth flashback last year! So Richard then finds out John was telling the truth! So remember the theories when we thought Richard was lookin for Locke and found Ben instead because their mothers both had the same name? Emily? I wonder if that can still be in play. But this definitely factors into the Others telling Locke that they've been waiting a "LONG" time for him. Except that it was Cindy (the Oceanic 815 flight attendant) that told him that! Hmmmm....who IS Cindy exactly?? Anyway, Locke wanted to find out how to leave the Island and Richard refused to tell Locke because it was privledged information. I'm guessing he'll run into Richard at another point in time as well. It also is important to note that Richard did not seem to have knowledge on the concept of Island Time Travel at that point in time. For being such an OLD man, you'd think he would have if it happened before. Maybe it didn't? Another thing....where did the Compass come from? Richard gives the compass to Locke in the future, but Locke gives the compass to Richard in the past. So who had it first? And does this tie into the other Flashback with Richard and Boy Locke when he lays all of the stuff in front of him, including the compass? He asked "Which of these belonged to you"? Well, Locke did take the sand and the compass...but he also took the knife. We still don't know why Richard got so frustrated with the Knife! And thus we are whisked away to another time. All of our Time Travelers seemed to be close by to each other. (I guess Dan, Sawyer and crew weren't too far away?) So when are we now? Does the hatch exist at this point? It would be nice to see if they are indeed near where the hatch was built. Anyway, apparently, the flash didn't sit well with Charlotte because she got even worse, and the nosebleed is out of control. She collapses to the ground unconscious and our Time Leapers rush to her side. Well, pretty crazy end for the episode. Here's a question, do we all care enough about Charlotte at this point to be concerned about her well being as a Cliffhanger into the next episode? Or is it more that we want to know about the crazy Island Sickness? Maybe a little of both. So, lots of theories were able to be expanded from this episode (Widmore, Hawking, Hatch). One thought to leave you all with. Where on earth are Rose and Bernard? Even if the majority of the 815ers bit the dust, I'm sure we need to find out where they are! Granted, we know the 2 actors that play them are only recurring characters and not full-time. But come on! At least explain it. I have faith that they will. So I guess that's it for this week. Lots of great comments and new readers last week. Keep it up! Let's get to discussing and I'll see you next week! NAMASTE! 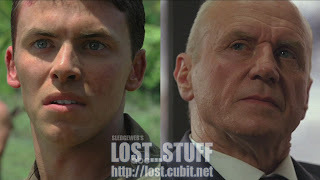 Thanks again to lost.cubit.net (AKA Sledgeweb) for always providing fantastic screenshots on your site for me to "BORROW!" My blog wouldn't be nearly as exciting without them! You catch so many things that I don't even think about as being a connection, (like the Eloise-Ellie thing). I love it!!!! Ellie=Eloise=Faraday's mom, so who is daddy? Whidmore? Alpert? And doesn't Theresa bear a striking resemblance to Charlotte? Could there be some significance to that? The idea of Penny and Desmond's son being Charles Widmore is funny, because then Penny would be her own grandmother. I had an even more absurd theory, that the mother in Los Angeles is Kate and that Aaron is actually Faraday, but that doesn't make much sense, so I think it's safe to forget about it. My brother also speculated that "Jughead" had something to do with "the incident." After you pointed out the concrete in the hatch, I believe there is some connection there. All signs seem to be pointing to Ms. Hawking as Faraday's mother, but my gut tells me that the producers are trying to make us think that so they can switch things up on us. I think Hawking and Daniel do know each other, but mother and son? The janitor guy said he had to take the rats to the incinerator so people wouldn't find out about Daniel's experiments, and I wonder if he'd name a rat after his mother unless the rat was special to him in some way. Then again, maybe I'm overthinking things. Well, if you connect Ellie to Eloise Hawking, then Dan told Ellie that she reminded him of someone who he had not seen in awhile or something like that. Maybe he and his mother are estranged? Nice crazy theory though Ian lol It's fun sometimes to have ridiculous ideas! (I still think Jack's ex-Wife Sarah might be Ben's Annie because Juliet was told that she looks like a mysterious "HER" in 2 different instances. Well Jack was told that Juliet looks like Sarah. And Goodwyn's wife told Juliet that she looked just like "HER" which I figured meant Annie....so i made the connection. We'll see! Anyway, thanks Anonymous! Glad you're enjoying the blog! And Noel, I am wondering too who the father would be if this all pans out. I just assumed someone American because Dan does not have an English accent. But who knows??? The moment we found out that those british guys were "Others" was fabulous. Widmore an other! Locke doesn't shoot him when he runs off, again this goes back to my question last week when Ethan was ready to kill Locke. Would it had worked, would he have died, that would have changed events of the futur?. If no Widmore, you have no Penny. If no Penny, you have no Dez. If you can't change the future, if it doesn' t work like this, than there is no way that Widmore would have died. This Charles Widmore thing is deep. You don't find it at all odd that Desmond just happened to stumble into Libby at the coffee shop at the precise time that Desmond needed a boat, and Libby's "husband" who owned a boat, just died. And it's not odd that Libby would give a perfect stranger she's known for 2 minutes, her dead husbands boat to enter some race? Somebody wanted Desmond to enter that race....somebody wanted Desmond on that island so he could push the button, turn the failsafe key, and do whatever he's doing now to save them. Even Mrs Hawking told him so. I'm not saying that Desmond knows what's going on, I'm saying I think Widmore is pulling Desmonds string without him knowing it. I think Widmore is using Desmond, and his love of his daughter as a way to hopefully find the island. The Island banishes Widmore, makes him spin the wheel. Richard makes Ben the leader. Ben spins the wheel, here comes John Locke. When does Richard grow out his long hair and wear the dirty Other's clothing? Maybe it was just a 60's thing! lol nice with Richard and the long hair. I like 'quantum leaping' ! I don't feel like we are flashing when we change times - so think it's appropriate to have a new phrase to cover it, as opposed to the flash we saw with Pen giving birth. IS Teresa talking to dead people? Or is it that in her mind she is in another time and Dad isn't dead yet ? Did Des actually tell papa Widmore that he has a message for Daniel's mom - I did not think so. So how does Widmore know he has a 'message'. I seriously hope that Widmore doesn't turn out to be Dan's father ! IF it's true that Hawkings is Dan's mom - and that she is Ellie - it's very interesting that Charles' former associate is now working with Charles' mortal enemy ! Did Des forget the year when he visited Dan, or did he just not want to tell the janitor ? Am confused about you wondering about Miles finding the dead. Wasn't this well established - that speaking with the dead is his talent/science ?? I'm more curious as to why Widmore would hire him for this expedition, that he knew he'd need someone on the team who could talk to the dead. Didn't Claire's mom have a sister ? Because Theresa is sorta reminding me of Claires mom who told Jack that Claire was his half-sister at his dad's memorial. But that makes no sense. Theresa could be lasting longer because Dan zapped her in a controlled environment, possibly using the numbers Desmond told him which is made her jumps more stable while the effect on Desmond and Minkoski were random and more unstable. And I don’t think she was talking to ghosts just her mind going to the time where her father was alive. I really like your Charlie is Charles theory. But it is a stretch, that means Charlie grows up on the island and when he gets off gets married and his wife gives birth to his mother!?! That is sick and diluted lol. Here’s my theory. From what we’ve seen of young Widmore, he’s a jerk. When Richard visits John, Widmore is the leader of the others and is a tyrant and Richard (and Jacob?) wants to get rid of him. But John didn’t pick the compass which belongs to him and Richard got frustrated because John isn’t ready yet. Than Ben comes along and Richard settles for him until John is ready to lead. Probably the only thing i got right on lost so far. Great recap Butzo. I wonder who or what is controling the "flashes" -- the first one was Ben with the wheel, but what is making them keep happening? I almost fell out of my chair when Richard talked to "Widmore" -- it was one of those "AHA!!" moments for me - didn't see that one coming! And I didn't catch the Elly-Eloise connection either, but it makes sense. I love the fact that we are still getting new mysteries, and yet some of the older ones are starting to come together. I want to see more of Sun soon and what she is up to. whew so many comments...can't respond to all right now. "IS Teresa talking to dead people? Or is it that in her mind she is in another time and Dad isn't dead yet ?" Good call! Didn't think about it that way. As for Miles talking to the dead. I'm sorry but that's not a SKILL you just "HAVE" lol There has to be more to it than what we've learned so far. Even when Sawyer asked Miles how he knew Rousseau and Karl were buried in the jungle....the writers decided not to let him answer right then. There's something going on there! We were gypped of the Freighter guys' back stories last year because of the strike, so I think we'll find out more soon enough! good call on the uniforms jeff...although I would like props and saying that the guy was actually Charles Widmore! I sooo said it! All the comments have been fantastic again, and I'll try to write more to them later! Keep it up. And once again, thanks to everyone for the props on the blog! Hey - ever hear of a 'medium' ? They talk to dead people - if you believe all that. A guy named John Edward has had a show for years where he talks to your dead relatives. And - we saw Miles do it in his flashback, when he went to the home of that black family and cheated the woman out of the money the dead kid had hidden in his bedroom. We all pondered a connection to Eko - though there wasn't one. But the real question to me is - WHY would Widmore want this guy on the team ?!? Whys end someone who can heard the dead talk? Because there are a lot of dead people on the island and most of them have something to say. My guess is in some yet to be seen event someone in the past will die that had vital info and Miles will conveniently be there to get that info from him/her. Come to think about it what if it ends up Hurley has the same power as Miles just a little more advanced, he can interact with the dead. Just a thought. I have just been under the impression that we still are going to get an answer to why the dead are walking and talking on and off of the Island and that it's not actually a "POWER" that these people have. This show isn't Heroes! It's one of the show's big mysteries (to be revealed I'm guessing in season 6). I have no doubt that Miles was recruited due to his ability to get in touch with the supernatural. But I believe the ANSWER to WHY he can do it is ALSO related to the island. Therefore, I still think it is a mystery yet to be resolved! I see your point, but if you relook at cabin fever all the flashes of young Locke are about him wanting to be “the warrior” when he really is the scientist. We’ve brought this up before about two opposing forces wanting the island and Locke is in the middle. In Cabin fever Abaddon (presumably hired by Widmore) suggested that Locke go on a walkabout just a "man and his knife" and earlier Richard gets upset because young Locke chose the knife instead of the just the island sand and the compass that Richard gave to Locke to give to Richard so he could give to Locke lol. My guess is Richards plan for the island is to be left alone and do the important work he alluded to in “the Brig” while Widmore has bigger plans for the island. ahhh touche' All good points there. And I somewhat do recall discussing that. I guess I wasn't sold that Abaddon was working for Widmore though. But then again...Abaddon gave Naomi her team and Dan was on that team (whose experiments were funded by Widmore), so it would make sense that he was with Widmore. Of course, we were never really clear on what Naomi's mission was either! I know...2 different things ,but I just had to throw it in there lol Man, i sure ramble in stream of consciousness sometimes! Butzo, great recap's as always. Very impressive on some of the things you pointed out last week that were spot on. Taylorman too. I'll be checking back every Thursday for all the things I'm not smart enough to pick up on. Could seem like a minor point and/or mentioned elsewhere, but has anyone given thought to why Charlotte is the only one experiencing the time travel effects? At first I believed that it was because she had been exposed to some radiation at some point. Perhaps by Faraday? Then I remembered that Charlotte was born on the island while the other time travelers were not. Maybe she experienced radiation from Jughead as a child? Or better yet, maybe the time travel is causing minor changes in the past that are affecting her very existence (think Marty McFly disappearing in Back to the future). Just want to say great blog. I spent the last year slowly catching up on the first four seasons so this is the first one I'm following in real time (tempted to try a time-travel joke, but I'll spare you). I found your blog last week and it's the perfect way to deal with the letdown of seeing an episode end. There's just so much to keep track of with this show, I can't do it all on my own. You do an awesome job of catching all the little things and making it more interesting. Keep up the good work. Just wanted to say this and maybe you can help... On Lostpedia, all the characters are given designated colors to show where they are in the show, ie: green = alive on island, blue = alive off island, red = deceased and orange = missing or unknown.... if you look right now on Lostpedia, according to them, CHARLOTTE IS ORANGE!!!! Is she "missing"?? Well I thought maybe if you consider the whole "missing in time"/"skipping record" thing but then the other characters Miles, Faraday, Locke, Sawyer, Juliet are all in green = alive and on the island.... Why is Charlotte missing??? Mike, you brought up the fact that several women seem to remind men of other women (Jack's wife, Juliet, Ellie, etc.) What about Theresa? Doesn't she look like the same "type?" Maybe that's who Daniel was reminded of when he saw Ellie: the woman whose brain he put into time-flash mode. If Ellie were his mother I imagine he'd recognize her right away (remember, I'm not completely sold on Hawking being his mother, but we'll probably find out within the next two weeks). Then again, there's the whole memory issue, where Charlotte can forget her mother's maiden name. I suppose it could also go along with your "estranged" theory. Maybe Daniel didn't meet her until later in life, so he never saw what she looked like when she was young (which could also explain why his mother has a British accent and he doesn't). Speaking of Charlotte, I think we are supposed to care about her well-being at this point. We know there's a man who's in love with her (awwww), and she apparently has some sort of ties to the island that might explain some of the unsolved mysteries. I don't think they're going to let her die. One other thing (sorry, when I re-read the post I thought of a lot more to say), they did give us a Back to the Future reference. Sawyer (I think) asks Locke "Where the hell were you?" and Locke says "A better question would be when the hell was I?" That line was almost directly lifted from Back to the Future. I love that movie! Wow, you guys are feeding my ego way too much. But I'll take the compliments! I'm glad new people keep stumbling upon the blog. Pass it on to your friends and thanks for the props! Thanks for stopping by again sminkey! Don't know about that Orange status on Lostpedia. I don't frequent the site THAT often lol But I would think that it's just a typo since we don't know what has happened to her just yet! And good call on the Back to the Future reference. That was so Doc Brown. They have to find a way to fit in: 1.28 Gigawatts!!!! Then I'll be impressed! Widmore snaps during the episode "shut up Ellie! ", sounds more like how a brother might yell at his sister than two people in a relationship. Widmore then would be Faraday's uncle, that is if you believe Ellie, potentially Ms. Hawking, to be his mum. 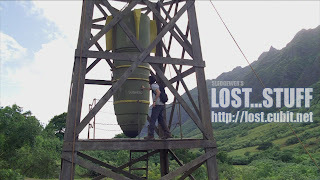 I'm not sure, I know we don't know anything BUT Lostpedia is really good at not making mistakes.. anyways I was just fishing around for some answers, I've submitted the question to them and the official Lost video podcast... I have a feeling Lostpedia is trying to tell us something.... How can she be "missing"????? About Charlotte on Lostpedia, the orange represents "Missing or Unknown." Due to the fact that the last episode ended with Charlotte collapsing, it's unknown whether she's alive or dead. That's why she's in orange. Hello, I've lurked a long while before finally posting. I have enjoyed your recaps and thoughts. I agree that Elle = Ms. Hawking = Daniels mother, seems like a given. Daniel was staring at Elle -- his mother as a young woman, impressed with her, unconcerned about her killing him -- because you can't change the past,she had never killed him before, so he was safe. She reminded him of someone (his mom) from long ago (probably had seen a picture of her young at some time), but in person and in an old black and white photo would be 2 different things. A very good chance is that she told him all about her time on the island before, and he knew that Widmore was there as well. (I don't think Whidmore is his father, I hope he isn't, the thought of uncle could be interesting, but again, I don't think so. Daniel knew alot about what was going on at that time. HE knew that Whidmore had been funding his research, we just never knew it till now. He obviously has known alot more about the island than he has let on all along, we just now got a glimps at WHAT he knew. I have a weird feeling that perhaps Charlotte is somehow starting to not exsist...she forgot what her mother looked like? One more thought in my long-winded post. What if Richard is upset when he meets Locke,not because he takes the knife, but because he realizes that THIS IS REALLY HIM! He rushes out because he needs to NOT influence Locke yet, he obviously didn't recruit and train him before,so he can't change it now. He is not upset with Locke, but just freaked because that guy a few years ago was right, and now we have to wait 50 years before he comes back again! Although I think that the disapearing in thin air in front of Richard could have been enough to convince him, just having a John Locke born on that day might not have been enough to seal the deal in a way that the picking of those items did. Thanks for giving me the chance to add my 2 cents worth. I think your vision and explanation of each episode is enlighting. They answer most of my questions and yet they open my mind for more questions. I do think that Ellie looks like Mrs. Hawking. I thought so when watching the episode. I have a feeling that Faraday and Penny are probably related (siblings). Thank for your comments they help explain a lot of things. I love time travel discussions lol. Dan was so not safe with Elle. If she shot him she would have killed adult Dan. That wouldn’t have stopped her from continuing her life, having a kid named Dan who was destined to be killed by his mother before he was born. And that’s the theme for this season, Destiny Calls. The way I see it on Lost past, present and future have already been written and might be happening at the same time. Every character has a destiny to fulfill. Look at the examples in Jughead. If Dan wasn’t there in the past to tell them to bury Jughead would it have been buried? Locke killed an other and Widmore snapped the neck of his friend were they always destined to die there or did Locke need to be there? If Locke didn’t tell Richard to come to his birth would he have ever known about him? Thoughts? By the way have you tied the knot yet? Time travel totally messes with my brain - but I'm wondering if Ellie will turn out to be Charlotte's mom? Explains why she would look familiar to Daniel. Also, maybe explains why Charlotte is having such a bad time with the time travel illness. Because she is in close proximity with who will be her future mother, and possibly her own father as well. Looking at the actess playing Ellie - she does look like Charlotte. Good question about why Widmore hired Miles. I wonder if Widmore thinks that Miles can find/talk to Jacob (since he may be a ghost)? I also now see why Widmore sent Abbandon to tell John to go on a walkabout - he met him in 1954 and knows he was supposed to end up on the island. I wonder if we will see John telling a young Widmore how/when he got to this island because I am still trying to figure out if Widmore was behind the plane crash and setting up the circumstances that got everyone on that flight. noel, If Elle is Dan's mother, I don't think that Faraday's daddy HAS to be someone from the island, if Elle IS his mom, she obviously left the island sometime, so anyone could be his dad. cdstedman....ooohhhh, you are right, I had it backwards - Dan couldn't have hurt Elle. I am disparadoxic I suppose. I agree Dan MUST have been there before. My son thinks that Dan is Jacob...my thoughts on jacob are too out there to post. His ego is a lost cause. And no, he's not married yet. This summer! As happy as the others were about Locke’s appearance on the island it doesn’t make sense to me that Richard would be upset that this is the guy. Post your out there thoughts, we like those here lol. I have Dan as third in my possible Jacob’s. Number one is Richard Alpert. I think he’s pulling a Kaiser Soze on all of us. Just in time to honeymoon in Hawaii for the last season of Los… I mean spend time with you and swim with the dolphins, yea that’s it. I tried to post a comment earlier and got an error! It's been a crazy day. But thanks stedman for knocking me down a few notches. Although my grammar? Come on man, I pride myself in that! I will admit to too many exclamations! You guys have gone crazy bouncing theories back and forth....so I'm gonna have to read them all in more detail later. Gotta get through this work day first! Anyways, thanks for all the additional compliments everyone, keep commenting! Wow, I loved this weeks episode! it was intriguing and just amazing! I think that Mrs. Hawking/ellie is daniel's mom, ellie looks so much like eloise hawking its crazy. i think it would be so weird if widmore is daniels dad, then him and penny would be siblings making dezmond his brother in law. so when dezmond came to him in 1996 he was actually seeing his future brother in law, so weird to think about! i kinda hope that widmore is his dad just for that crazyness, lol. is anybody else wondering (amidst all the confusing time jumping)what in the world happened to claire! I think she has a lot more to do with the island then met the eye when we first saw her. i mean in the first couple of seasons i could see how locke might have something to do with the island, being healed and mysterious and all, but claire! i mean she didnt seem like the type, all sweet and such. is she dead, i have heard theories that she is and theyre very believable, but she is in s6 so......whats up with that??? and what about aaron??? baby surrounded by terror? the fotune teller said if he wasnt raised by claire, aorund her goodnes he would become bad, but so far he looks like the perfect little kid. and if claire is alive how is that going to work? will she want him back, or let kate keep him. and he looks a ton like charlie! i just cant get over it! i think its so sweet that dez named his son after charlie! i also love your blog! its fantastic!lol. Well all we know about Claire is that Emily de Ravin (not sure how you spell her name) is not a full time cast member this year. There are rumors she might show up though. season 6 she'll be back to full-time. So there's definitely something up with that! Maybe she's not moving through time with the rest of the crew somehow? As for her being dead, there is a lot of evidence to support it....when the house in Othersville blew up with her in it and sawyer picked her up...she asked for Charlie. What was that all about? And then she made a comment later saying "I'll live" and Miles (ghostbuster extraordinaire) said "i wouldn't be too sure about that" And then Miles kept starting at her for the whole episode before Daddy came to take her away. Seems to fit the bill. But I don't think it's that simple. We need to have that reunion scene of Jack and Claire while they're both alive and when he knows that they are related. Of course, with dead people walking all over the island, i guess that could happen anyway. I'm guessing she's still alive though. good question on aaron though. I'm interested to see how that all pans out too! Okay, finally caught up! Daze, interesting theory on Richard being scared that it was actually LOCKE. Or maybe annoyed because he knows that Locke doesn't end up on the Island until he's much older. Because Richard makes the comment "he's not ready yet"
ns81, thanks for the blog compliments! Glad you enjoyed. Same theme with the Penny stuff. Yeah, I guess you could look into it and think Penny is hiding stuff. But if she is, it kind of takes away from the classic moments that have already happened between Desmond and Penny if she has been withholding vital information from him. As the producers always have said Desmond and Penny are the trule Love story of LOST. I think Penny is just truly worried that Desmond will get stuck on the Island again and she'd never be able to get him back (hence why she decided to go with him....my guess is they both end up on the crazy island and Ben better not kill her or I put him on MY list!) Anyway, as for her knowing Desmond was lying...I'd just call that a lover's intuition! She knows him so well...that she could just tell. All going back to the "LOVE STORY" theme. But that's just my take...and you could totally be right! Keep up the great discussion everyone! great blog and comments again really makes you think im still really confused tho. i think dan is gonna be charlottes dad n thats why he loves her so much! might be a little disgusting but just a thouht ha! maybe ellie is her mom who charlottes forgotten what she looks like ugh i dunno im gonna hav to watch the box set again theres so much goin on!!! OK here are a couple thoughts. In the first episode this season we saw John Locke get shot when he was climbing up to see the drug plane after it crashed. Remember back in season 1 when Locke and Boone first find the drug plane and Locke lost the use of his legs for a short time? I think that's why he did, because he was shot there. Also We now know that Locke saw the drug plane crash. Well back in season 1, the way he knew where the plane was was because he saw it in a vision. Now we know that vision was actually a memory. A far out thought...but with Lost is anything really far out there?...what if the casket that Jack saw in season 1, the one that was empty, wasn't really his dad's casket but Locke's casket instead? Also I think the reason Locke appears dead off the island right now is because his conciousness is travelling. Remember in the Constant when Desmond was travelling his body collapsed while he was gone? That could be why Locke appears dead and why Ben didn't answer Jack's question about whether he was dead or not. Rick, I agree with your thoughts on Locke and the limping and getting shot near Yemi's plane. Definitely makes sense. Good call on him having the vision of the plane too. But remember in the vision he also saw his mother pointing to the plane and it was from a different angle than how he actually witnessed it. (all semantics i guess). And then of course there's also him knowing about Boone's "Jill falls up the stairs" comment when Boone had never mentioned it. So there was more to that dream still! But all of this makes me wonder more about Desmond having those flashes of the future with charlie dying and stuff. I mean, I guess now that we know about the Island having some "TIME" elements to it, we can deduce enough to know that Desmond was affected by the raditation/electro magnetism when he blew the hatch that he was able to see things that were going to happen. But then...are we still going to see Claire get on a helicopter at some point? there i go rambling again! i was with you for a second about Locke consciousness time traveling. That makes sense. Only thing is...i think that's what Theresa (dan's "test subject") was going through as well...but she still showed signs of life. same with desmond and minkowski...they were still "ALIVE" in body...their minds just weren't present. Richard specifically told Locke that he'd have to "DIE." It's a pretty good theory though! And it might not be far from the truth! Mike, I thought it was "Theresa" not "Jill" who falls up the stairs. Wait a minute...Theresa? The girl whose mind Daniel made time travel? Could she actually be Boone's childhood nanny? Good call Ian! I double checked and Boone's nanny was indeed Theresa. Kinda weird though, since she's from the UK and not the US. Why would she be their nanny in L.A.? I wouldn't be surprised if Boone's family hired a British nanny. Didn't Shannon work as an au pair in France? If I remember correctly, Shannon's friend at the ballet classes was offered an au pair job, but turned it down. In one of the deleted scenes on the DVD set, Shannon is shown taking the job. Even though it wasn't officially shown as part of the story, I think we're to assume it happened, since Shannon said she recognized the lyrics to that French song because she lived with a guy who had a kid who watched a fish movie over and over. That "Theresa falls up the stairs" incident always seemed incomplete to me. It seemed like there was more significance to it that they weren't showing us. They've already possibly revealed why Locke was losing his ability to walk in that same episode, so maybe the Theresa story is coming up soon. well...same season not the same episode (the theresa and locke getting shot thing) but i get what you're saying. Yeah, and if she was living in the states (theresa) that would make sense since Dan was probably there too. It'll be pretty crazy if it's linked! The time travel rules are driving me nuts. cdstedman said if Faraday would have gotten kiled in 1954 then adult Faraday would have died. I get that point-of-view. But what confuses me is if Faraday would have gotten killed in 1954, then how could he have been born in 1975 (or whenever)? Furthermore, how can anything happen to the timetravelers in the past before they were born? Because even though they are in the past, from the point of view of their lives it’s the present. So Dan, Sawyer, Locke and crew can be killed in the past and still be born a few years later without messing up the timeline. Their adult deaths would never interfere with them being born no matter what time they’re in, because as Dan keeps telling us you can’t change the past. the nice guy he seems to be,or is he up to something! Hi Peter, thanks for being a loyal reader! Actually, last season do you remember the Jack-centric episode "Something Nice Back Home" where Jin, Sun, Dan and Charlotte went to the Medical Hatch for supplies? Dan was being all careful with Charlotte and went into the hatch before her just in case there was any danger. Jin and Sun talked in Korean asking each other if Charlotte knew that Dan liked her. Sun said that she's a woman, she definitely knows. And of course Charlotte understood because for some reason she knows Korean! So I just see Dan's profession of love this season as just building on that! Thought I'd post this here rather than in last weeks blog so it gets read. man, i'm gonna have to watch that episode again sometime to know for sure. I thought that Locke just used that as an excuse so Boone didn't think he was crazy. But you could be right David. Perhaps, we could also attribute his inability to walk to the "Island" keeping him from climbing up to the plane himself since it wasn't his time to die yet. Some of that course correction stuff at work. good question though. maybe someone out there will have enough motivation to rewatch that episode and post their findings lol! I havent seen that episode in a while but from what I remember, Lockes leg was hurt as he was walking along, but suddenly got much worse when they got to the plane. David’s right, Locke did get some shrapnel in the leg but I think it had healed by then. And in the episode after that one when Shannon asks Sayid to kill Locke for her, Locke and Sayid are walking to the plane and he said he just had a charlehorse. ahhh right, so Locke knew the "island" was causing his walking issues and that's why he lied to Sayid. Because we know that wasn't a charlie-horse! "On the island, Locke and Boone put final touches on the trebuchet, which they have been building in order to crack open the hatch. Boone makes small talk, wondering about Locke's life back in the real world. Locke responds that Boone would find his story boring and proceeds to spring the trebuchet which doesn't even dent the hatch and instead, collapses under the force. Boone notices that Locke has a piece of shrapnel embedded in his leg. Locke is oblivious to the pain and pulls the shard from his skin. That night, he bandages his wound and tests his reflexes, searing the bottom of his foot with a burning ember, but feels nothing. He stares down at his legs, wondering if his paralysis is returning. The next day, Locke and Boone work to rebuild the trebuchet. But Boone has grown weary of the task and expresses doubt about what they're doing. Locke says that the island will tell them what to do. And for the first time, we can see that Boone is beginning to doubt Locke. We also see that Locke is having trouble walking. 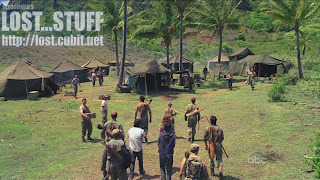 "Out in the jungle, Boone finds Locke at the hatch and tells him that he's fed up with working everyday without results he doesn't think they can open the hatch. But Locke insists that they were meant to find it and open it. "The island will send us a sign " And just as Boone is about to write Locke off as a complete nutcase, a plane buzzes overhead. When Locke looks down, he finds Boone covered in blood, chanting the phrase, "Teresa falls up the stairs, Teresa falls down the stairs " Confused, Locke turns back to see the woman who claimed to be his mother here on the island! pointing off in the direction of the plane. Then Locke looks down to find himself paralyzed, back in his wheelchair. He calls out, terrified, begging the island not to take back his ability to walk. And just when we think things can't get any weirder, Locke bolts awake in a cold sweat it was just a nightmare. He jumps up from the campfire and goes to wake Boone. "Back at the hatch, Locke relays his dream to Boone he thinks that the plane is the sign they have been hoping for. But it was just a dream and now Boone really thinks Locke has lost his mind perhaps even drinking that crazy paste that made him see his sister (back in episode #111). Locke counters with a question of his own that shocks Boone "Who is Teresa?" Boone clearly recognizes the name it was his babysitter, who Boone used to torture by calling her up and down the stairs on the intercom. He explains that one day, Teresa took a bad step and fell. Is this something he mentioned to Locke one day while working on the hatch or does Locke's dream hold some sort of truth? "Locke and Boone move through jungle, but Locke's legs fail him and he trips. Boone wonders what's wrong, but Locke claims he's fine. He looks up to spot a rosary, dangling from a branch, when suddenly, a decomposed body falls from the tree above them. They look over the body and conclude that he was a priest. But closer examination reveals a gun and priests don't usually carry guns. "Back on the island, Locke struggles along with his arm thrown over Boone's shoulder. They stop to rest when Locke looks up past Boone, who follows his gaze toward a yellow Beechcraft, propped up in a tree canopy. Knowing his legs won't let him climb, Locke tells Boone he's going to have to go up and find out what's inside. hmmmm...so the injury was separate from the shrapnel in that episode....wait didn't locke get shot in the RIGHT leg a few episodes ago? could they have messed up? I think Richard was upset when leaving young Locke's house because Locke DIDN'T choose the compass. Because if Locke had chosen the compass he would have been their new leader instantly. Richard knew Locke was the one that gave him the compass, so Locke should have chosen the compass. So it all makes sense that Richard was mad. He really thought that Locke was going to be their leader at that time. Which brings us back to the pharase from Richard, "We've been waiting for a long time", when Locke finally became their leader. It all makes sense. That's the most confusing part about it though. Locke DID choose the Compass (as we stated in the posts you didn't read! lol). He chose the Sand, Compass and the Knife...and the knife is what set Richard off. I'm with you though, if Locke hadn't chosen the compass, then it all would've made sense. but he did! According to Lostpedia, Locke never chose the compass or the and, he just examined it. "John inspected the container of the granules and the compass. After examining the items, John picks up the knife, to which Richard seems upset. He asks John if he's sure, and after nodding affirmatively, Richard snatches the knife from his hands and takes the other items away, put all of the items back into his bag and stands up quickly. Florence enters the room and asks how John did. Richard responds sternly that John was not quite ready for his school and walks out of the house. Florence scolds John, asking what he did wrong; John looks down dejectedly." I guess when you have a wiki, you run the chance of coming across false information. I was going off my blog from last season. I know for sure I watched Locke SELECT those items and put them in front of himself. But, after you pasted that i was a little more curious. 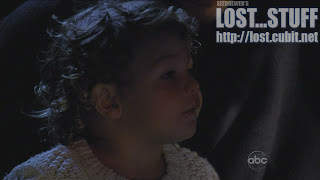 When in doubt....you can't deny what the official LOST website (lost.abc.com) has for their episode recap! "Later, when John Locke is five years old, Alpert visits him in a foster home. His foster mother tells John to be on his best behavior. Alpert explains that he runs a school for kids who are extremely special, and they believe John might be one of them. Alpert notices a crayon drawing that's a swirling black cloud next to a screaming face. Alpert is amazed and asks John if he drew it. John nods. Alpert removes some items from his bag and places them in front of John. They are a worn baseball mitt, an old book, a glass vile filled with sand, a vintage comic book, an ancient looking compass and an old knife. He asks John what items already belong to him. Young John looks confused but concentrates on them. He reaches out and first selects the vile of sand. Then he selects the compass. He looks at the ancient book, but the knife catches his eyes and he picks it up. Alpert is immediately disappointed and questions the choice of the knife. Is John sure it belongs to him? Young John nods yes. Alpert is disappointed. He puts the items back into his bag and stands to leave. John's foster mother returns, and Alpert tells her John isn't quite ready for their school. " in case anyone wants to watch the scene, i found it on youtube. you won't have to wait much longer. I got done super early today! I’d passion to informer that too! Well, things are certainly going off in unimaginable directions, compared to Season 1 and 2! The writers are amazing. I also noticed that Ellie seemed to also be speaking like Mrs. Hawking, just in terms of her voice inflection, so as many posts have said, she seems likely to be her at a young age. Different topic: how many of our Flight 815 survivors are there left and where are Rose and Bernard (and Claire for that matter)? A couple more 'extraneous survivors', as I call them, were killed off this episode. We also don't know why the Others call it 'their island' - how long have they been there? They obviously came there from somewhere else at some point in the past (even if some were born there). So these Latin-speaking Others are actually who the Dharma-ites referred to as the Hostiles then - but all non Oceanic 815 people are Others to them. It was kinda funny to hear Juliette call them "Others" - when she herself is/was one to us. Still waiting for Rousseau's timeline to come into play also. But it does hurt the head to try to keep track of what year it is and who might be who in the future or past! Thank God for the blog, Mike. The Widmore revelation this week was cool as was learning that Dez and Penny named their baby Charlie - awwww! So we finally have the link with Widmore being on the island and of course spending years trying to find it again, which certainly would explain him funding Daniel. Did anyone else feel that by Desmond confronting Widmore that he of course must have been followed (after he left) and that Widmore will know know exactly where he and Penny are? I don't want to spoil much and you're already ahead of this episode now...but at this point the producers did confirm that the Flaming Arrow attack killed most of the "unknown" 815ers....Asking where Rose and Bernard are is a good question and you might be asking for awhile! lol Asking where Claire is is a great question too and I had more knowledge when watching season 5 about Emile de Ravin's casting status....but I don't want to spoil it for you! But needless to say, you will be asking about that one for awhile too! Definitely good speculations about Desmond being followed...and of course don't forget that he is bringing Penny closer to someone that she does NOT need to be around! Glad you're still enjoying the blog. Enjoy the rest of season 5....it's a great one! Yeah, it's funny how I said I might skip commenting on a few shows and then I couldn't resist saying something about every episode! I almost resisted commenting on this one, since it mostly provided a lot of set up for things to come, but then again it had a lot about Desmond and Penny, and that relationship never gets tiring. But the main reason to comment is the revelation that Charles Widmore is on the island, which confirms what we've suspected all along; he has a deeply invested history ON the island! Yikes, Desmond and Penny name their son Charlie. That's the third character on this show named Charles or Charlie. Is there any such thing as a coincidence on this show? For all the time Juliet has spent in the past (or rather, the future) with the Others, she still plays her cards close to the vest. You'd think at one time or another, since she defected to survivors camp back in season 3, she would've sat around a campfire with everyone and spill everything she's ever known about the Others and the island for six hours. Jughead is a great episode. And there may be more than meets the eye to the episode than on first glance. You may see some theories in the comments of this one or the next one. But, you'll find out soon enough! I think it was definitely a coincidence with the Charlie/Charles stuff....though it was fun to theorize back then! I've got to stop commenting on every episode if I wish to move forward at a normal pace, lol. So just some quick thoughts this time. Great cliffhanger. I'm sure Charlotte won't die, we haven't seen anything of her story yet. Plus she and Daniel are too cute together :) But it'll be interesting to see how they get out of this one. Loved seeing Des and Penny again. Looks like they won't be allowed to live happily ever after on that boat, but what a premise - them heading unknowingly to Ben's hands! Oh, and their child's named Charlie - how sweet! Good catch on Widmore being one of the military guys, Mike. Sometimes I envy you English speakers your ability to distinguish accents so well. Sure they sound different to me too, but I can't place them so well. One crazy theory: if Mrs. Hawking really is Dan's mother (everything seems to be pointing that way), and if she's also Ellie from the island, and with Widmore being on the island at the same time... Could Widmore be Daniel's father??? Crazy, but this show is like that. Ahh yes Penny/Des and their son Charlie...loved that. Think I welled up a bit when I found that out. Nice on calling Widmore. lol Ahh I would've never known you weren't an English speaker since you type in English pretty well. What part of the world are you from? But yeah the English of a very distinctive accent (of course, since it's their language originally...maybe it's all of us that have accents! ).